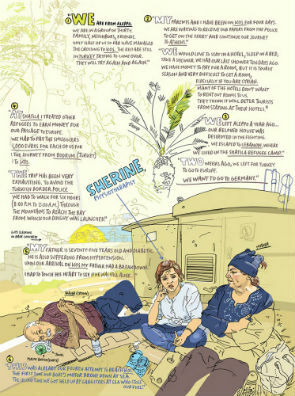 I first came across the graphic reportage of Olivier Kugler a few years back in the pages of small press “graphic newspaper” Modern Times. 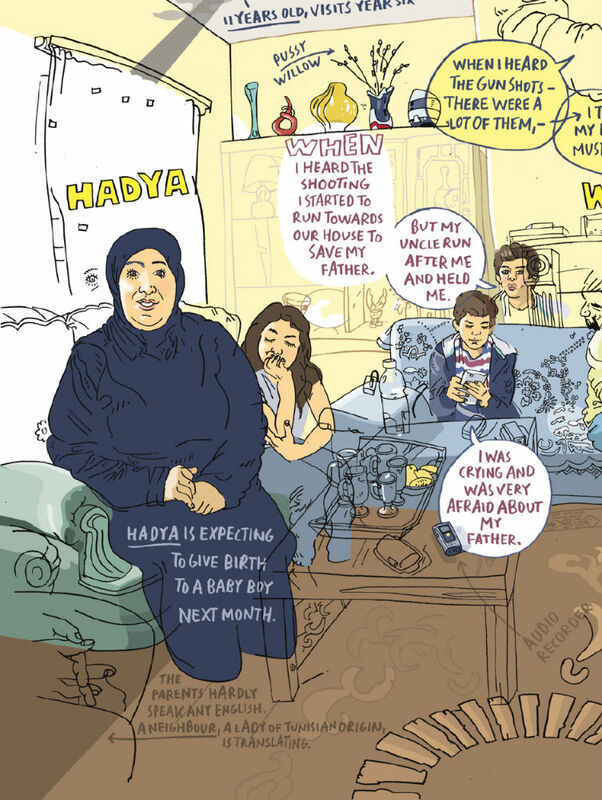 Since then Kugler’s evocative portrayal of the plight of Syrian refugees – practice that captures the pure humanity of one of the greatest international crises of our time – has gone on to far wider acclaim and coverage in the media. 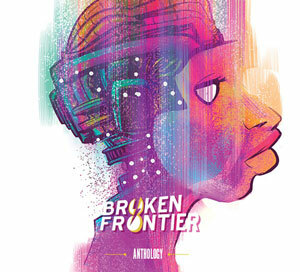 His work has also been exhibited in locations like Somerset House, Rich Mix and House of Illustration in London, and both the Fumetto International Comix Festival in Switzerland and the Helsinki Comics Festival. 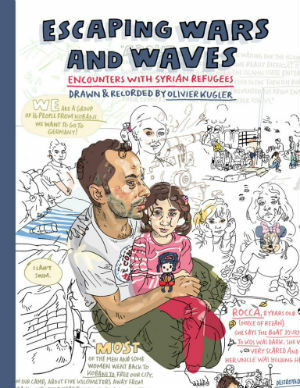 Escaping Wars and Waves collects Kugler’s illustrated interviews with Syrian refugees, mostly from work commissioned by Médecins Sans Frontières. It provides an unforgettable account of his meetings with both individuals and families in locations that included Iraqi Kurdistan, Kos and the Calais Jungle camp, among others. 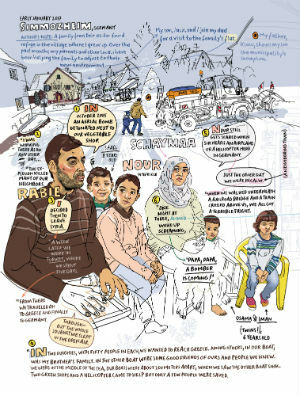 Kugler’s approach was to request photos that would be used as reference for his graphic reportage and interview the refugees about their own stories. 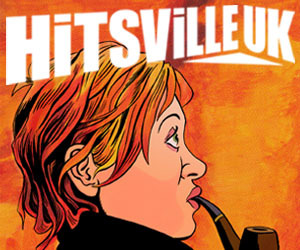 The result is a unique record of their histories, mostly more correctly defined as graphic narrative than comics per se. Individual portraits are surrounded by moving text accounts, balancing both the requisite responsibilities and restrictions that were a part of the process. 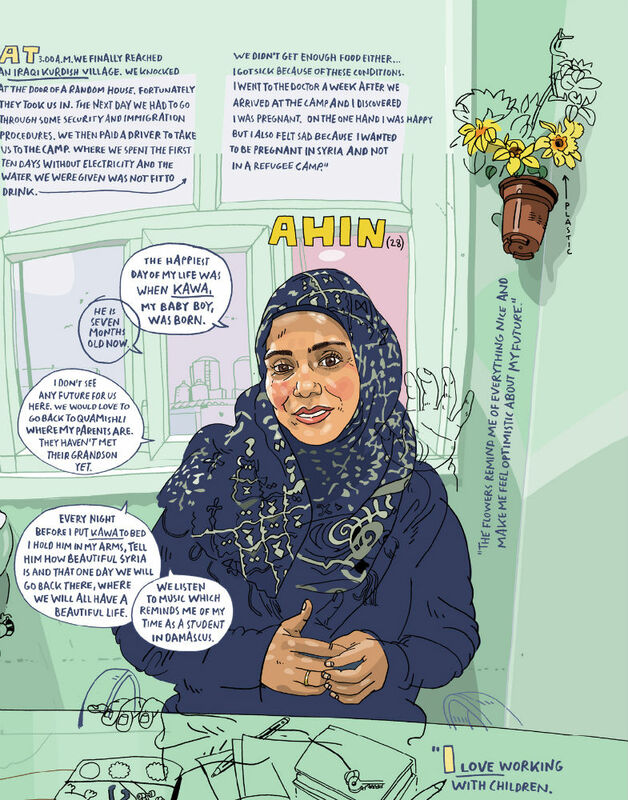 The three main sections of the book allow us to see the refugees’ experiences from a number of different perspectives; from those at the start of their journey in Iraqi Kurdistan, those seeking entry to mainland Europe in Kos, and those who have made it as far as Calais. Presenting a wider picture of the crisis Kugler also occasionally gives us the thoughts of the aid workers and organisations involved in the support of those affected. Escaping Wars and Waves is never an easy read but it is an essential one. The many stories portrayed are often complex ones that both elicit empathy and convey the despair of the interviewees but also have a capacity to inspire as well. 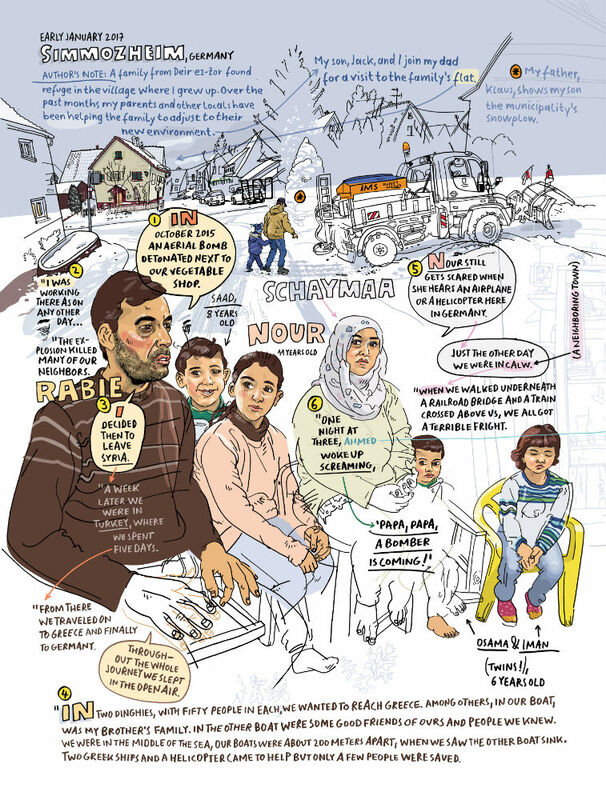 In Domiz we meet 55-year-old Muhamed forced to flee the bombing in Damascus and now living with his extended family in appalling conditions in just one tent. 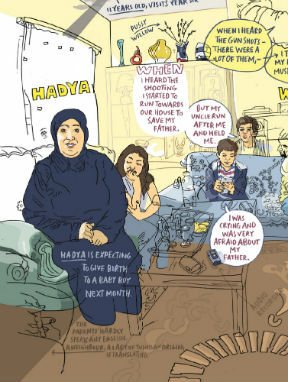 On Kos, Noura tells of living in Aleppo, encountering the aftermath of a suicide bomber and fearing from then on that every time she left the house could be the day she died. While in Calais the plight of three young men in one shelter in the Jungle is heartrending, laying out in stark detail exactly why they are so determined to cross the channel tunnel. Other stories are sometimes surprising and always deeply affecting, like that of former army sniper Djwan who now teaches breakdancing to kids within his camp. Each busy page captures the ordeals, the needs and the hopes of their subjects in an initially brief and fragmentary moment. The skill of Kugler’s approach, though, is that in each interview entire narratives don’t just echo backwards in time but also speculatively project forward as well. Visually, Kugler’s profiles are rooted in both realism and the representational, with pertinent soundbites from each subject drawing the eye to the comprehensive surrounding accounts of their struggles that elaborate on their individual situations. The great triumph of Escaping Wars and Waves is that it underlines the reality facing those who have been so unforgiveably dehumanised by large swathes of the media; Kugler understanding from the outset that these stories speak for themselves with little need for additional commentary. Nominated for the Best Graphic Non-Fiction category in our 2018 Broken Frontier Awards, Escaping Wars and Waves is a vitally important piece of graphic journalism; a book of quiet intensity that communicates its subjects’ stories with a profound and respectful sensitivity.